Course Description: This course extends students’ experience with functions. Students will investigate the properties of polynomial, rational, logarithmic, and trigonometric functions; develop techniques for combining functions; broaden their understanding of rates of change; and develop facility in applying these concepts and skills. Students will also refine their use of the mathematical processes necessary for success in senior mathematics. This course is intended both for students taking the Calculus and Vectors course as a prerequisite for a university program and for those wishing to consolidate their understanding of mathematics before proceeding to any one of a variety of university programs. In this unit, students will recall a few basic facts of a distance time graph. They will review transformations and their effects on a given graph. The concepts of function notation, relation, range, domain, and function notation will all be reviewed. Finally, strategies will be employed to aid in the understanding of rates of change. In this unit, students will review the rules associated with exponents. Topics covered in this unit are: exponential functions, logarithmic functions, identities and applications. This unit examines the meaning and application of radian measure. Students will make connections between trigonometric ratios and the graphical and algebraic representations of the corresponding trigonometric functions and between trigonometric functions and their reciprocals, and use these connections to solve problems involving trigonometric equations and prove trigonometric identities. This unit develops students understanding of average and instantaneous rate of change, both numerically and graphically, and how to interpret the average rate of change of a function over a given interval and the instantaneous rate of change of a function at a given point. 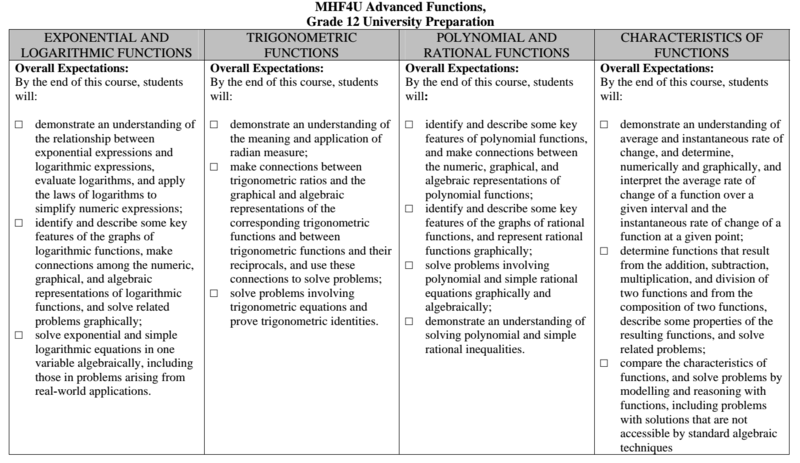 In this unit students learn to identify and describe some key features of polynomial functions and to make connections between the numeric, graphical, and algebraic representations of polynomial functions. In this unit students will also represent rational functions graphically. This final unit focusses on the theory and practice of performing arithmetic operations on entire functions, including but not limited to the algebraic, graphical and practical implications of performing those operations.